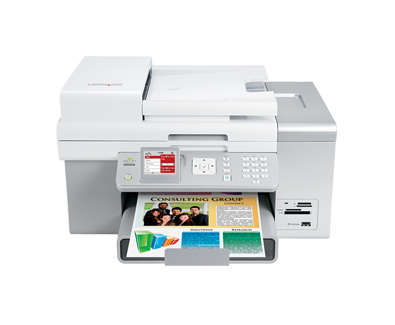 The Lexmark™ X9575 Wireless Office All-in-One with Fax offers the convenience of wireless technology combined with efficient two-sided printing and business class speeds for increased productivity. (4) Connected to active PC. Purchase USB Flash drive separately. (1) Black priniting in draft mode. (3) Non-refillable cartridge licensed for single use only. Return empty cartridge only to Lexmark for remanufacturing, refilling or recycling. A variable amount of ink remains when this cartridge must be replaced. Replacement cartridges (41A, 42A) sold without these terms are available through www.lexmark.com. 인치 - H x W x D): 10.6 x 18.3 x 18.1 in.